There is a door at the end of a silent corridor. And it’s haunting Harry Potter’s dreams. Why else would he be waking in the middle of the night, screaming in terror? 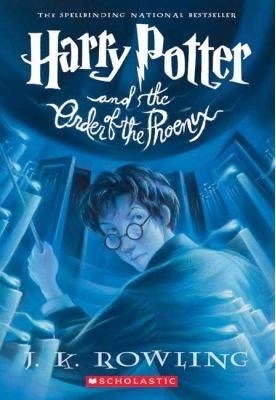 Harry has a lot on his mind for this, his fifth year at Hogwarts: a Defense Against the Dark Arts teacher with a personality like poisoned honey; a big surprise on the Gryffindor Quidditch team; and the looming terror of the Ordinary Wizarding Level exams. But all these things pale next to the growing threat of He-Who-Must-Not-Be-Named—a threat that neither the magical government nor the authorities at Hogwarts can stop. His fate depends on them all. Only gifs can explain how I am feeling right now. Officially this series is dark now, I don’t want to suffer but also can’t stop reading, I was deep in a reading slump but this book dragged me back. I realized while reading this book that I don’t hate Voldemort as much as I do to Umbridge, She is an annoying psycho, I was losing my temper again and again. While watching the movie I thought Harry is just getting rude but after book now I can relate to him and justify each and every action of his. The Plot, twists, and turns are absolutely fantastic. I am glad that I didn’t read this book back when it was coming out, There is no way I could wait for this much for the next one…NO WAY…We get to met Luna and many other new characters, Story is more inclined to the mystery and real-world problem but on the positive side, I didn’t have to suffer Snape that much, Though Umbridge was certainly more hateable then him…We got another past story and I must say, James, Sirius, and Lupin are gems…Okie they were a bit trouble maker but Snape wasn’t also flawless. James is kinda cute though 😁. Obviously, He got style…It is the first time we get to watch Dumbledore’s SWAG and yes he got it. Fred and George keep bringing some lightness in the dark story which was fun to read. I can’t wait to read more about D.A’s progress, There are so many things I loved about this book that If I’ll start to right it is gonna be a HUGE post 😂, So I’ll not. I think everyone hates Umbridge so much, I never hate anyone like this before…Luna is too sweet and different from other characters I’ve read before…Haha why your family thinks you are like her?you have theories or are you dreamy? Also, I think Umbridge is worse than any other villain in this series [except from you know who] >< that woman makes me hate pink with all my heart [even when I love the color]. Why?? ?Girl please finish this series…I also have to deal the dark stuff..but I am ready….I can’t hate Umbridge more…I just want to kill her like chucky kills people. This is one of my favourite books in the series. Umbridge is seriously evil! It was…Agree…Villains disguise as good person are worst…you won’t able to trust anyone after meeting that kind of characters. Yes, I agree about Umbridge. I think she’s a more tangible kind of evil. Umbridge is the worst! Just wait for the next 2 novels, they are dark and sad!! Agree about Umbridge. She drove me mad in the movie with her little squeak too.